In what is turning out to be a singularly dismal August at the movies, we get our best chance at a hit this weekend, but don't... get your hopes up. Horror remains one of the most lucrative genres out there, given that they are generally extremely cheap films to produce, and occasionally breakout and spawn a franchise or two. In the case of this week's leadoff film, “a franchise or two” is literal, as we're talking about the prequel to a spin-off and if the timeline gets more complicated we may need to pull Shane Carruth in here to explain it. The “creepy doll” sub-genre of horror is a time-honored classic, based on the natural revulsion for those over-detailed porcelain dolls that just shouldn't exist I mean look at them why would you even make that? The first Annabelle movie attempted somewhat poorly to capitalize on that, but the film just made for cheap jump scares. Here, director David F. Sandberg (recently of the acclaimed Lights Out) seems to have stumbled on something more, with reviews for it being significantly better. And with the loose connection to the Conjuring series (which seems to be taking on a life of its own with *another* spin-off and then a cross-over film, it's like Marvel up in here), this sort of midwestern gothic approach to horror could be a solid performer for at least one week. 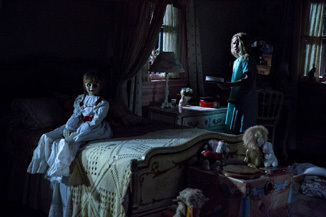 The ask might be a bit too much after the weak hold of the first Annabelle, but it doesn't take much for this to be a success, so around $30 million (well down from the $37 million of the first) is probably enough. Speaking of keeping costs down, The Nut Job 2: Nutty by Nature (oh, *I* get jokes) arrives in theaters this week in a massive release despite the underwhelming $64 million performance of the original three years ago. That's due to its microscopic $30 million budget, and the line has mostly been held here for the sequel. Cheapness in animation isn't invisible, though, even if it is an entirely South Korean produced film, and the slipshod nature of this film is even more apparent for this sequel. Will Arnett and Katherine Heigl return as the voices of the two main squirrels in this film, this time taking on a group of land developers who want to rip up their park for an amusement part run on the cheap (*cough*) . While a bit of mayhem is appreciated, the humor in this is pitched way low on the age scale, and will have next to no crossover with the adult audiences needed to really make something like this a hit. It should also underwhelm compared to its predecessor and should come in with around $14 million this weekend. Opening in national release is The Glass Castle, a drama based on the memoir of a woman (Brie Larson, when older) who grew up in a nomadic family with an alcoholic, but adventurous father (Woody Harrelson) and an accommodating mother (Naomi Watts). Playing like a hyper-charged and more depressing Captain Fantastic, it deals with Larson's coming to terms with her unconventional/neglectful childhood. From director Daniel Cretton (who worked with Larson on Short Term 12), it's unfortunately getting largely panned by critics for glossing over a lot of the darker material, and despite game performances from the main cast, this seems likely to be forgotten in short order, and ignored come Oscar time (which it's clearly shooting for). I'd expect around $4 million for its 1,400 venue opening weekend. Returning films are dwindling in significance as the late summer films start to exit from the picture, and The Dark Tower will likely fall beneath Dunkirk in its second weekend, with the Stephen King adaptation underwhelming in basically all respects. Dunkirk, meanwhile, is moving up into the realm of Oscar favorite and showing actual legs, as it closes in on $150 million domestic, a remarkable feat for a nearly wordless, non-star driven war film about a battle most Americans weren't aware of. It should bring in about $12 million this weekend, surpassing the $9 million that The Dark Tower should grab in its second frame. The Emoji Movie was a rare kids film with poor legs, but that's all justified, and it should get cut in half again this weekend to around $6 million. Bad Sony, Bad! Girls Trip didn't live up to its strong second weekend, but held okay, and seems headed to around $125 million domestic, which is a very strong result and might shut up the “women aren't funny” brigade for about 7 seconds. Give it $6 million as well this weekend.